Will T-Mobile be announcing a new initiative involving unlocked phones on Wednesday? A few days ago, we showed you an image of the Samsung Galaxy Avant, a low priced 4G LTE model headed to T-Mobile. While the phone has yet to have been unveiled by Samsung, it still is playing a part in possibly tipping us off to one of the new initiatives that T-Mobile could be announcing on June 18th. On that date, the nation's fourth largest carrier will be announcing UN-carrier 5.0. 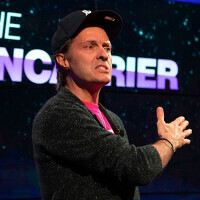 The speculation is that T-Mobile will be introducing simplified pricing plans on Wednesday. That means you get a bottom-line price, including all taxes and regulatory fees. In other words, there will be no surprises on your monthly bills. But there could be more. A test version of the Samsung Galaxy Avant has been discovered with the model number SM-G386T. What makes this handset so interesting is that it featured a pre-installed app for carrier unlocking of the phone. Clicking on the app and following some directions resulted in the phone becoming unlocked. At that point, a Verizon SIM card inserted into the phone worked perfectly. There are a couple of interesting notes. Once the carrier unlocking app was used, it did not show up again on the phone once the handset restarted. Also, when the general care team was called to discuss the unlocking of the phone, they explained that the department was no longer responsible for device unlocking. When you add it all together, it does seem to add up to the possibility that T-Mobile will be announcing some sort of plan that will keep you from being locked into the carrier's network if you want to leave. First came the end of the two-year lock-up with the extinction of subsidized equipment contracts. Now, we could be on the cusp of seeing the end to locked phones for T-Mobile customers. It does add up. If you're no longer beholden to your carrier for paying a portion of your handset, perhaps you should be allowed to take that phone wherever you want to go. Looks like a few more small, but nice, improvements from T-Mobile. Every phone should come with unlocking that is simple and easy. And all Android phones should come with rooting that works the same simple way. Nexus 5 is unlocked, not sure about others. I hate to be the advocate for devils like Verizon or AT&T, but I can understand why they wouldn't want phones bought on contract to be carrier unlocked. That way, someone can't just go into an AT&T store, buy 5 new Galaxy S5s on contract, unlock them, then say "screw you!" and laugh all the way to a T-Mobile store. Well, people actually can, but at least carrier locking them can cut down on occurances. As for Verizon, it's stupid that you can't bring your own phone or use one of theirs after your contract is fulfilled. As for bootloaders, yeah, they should all be unlockable, and all phones should be able to get root. Not to mention the ETF, which would avoid anyone going laughing to another carrier, once the phone was bought, subsidy or not, it's the owner's property. Lock is an affront to the human right of property that only people in the American plantation put up with. The Galaxy Avant sounds kinda interesting. 4.5-inch display with 540 x 960 pixels, 5MP rear camera, dual-core 1.2GHz processor, 1GB of RAM, and 8GB of expandable internal memory, and LTE. If it comes in around $199 off contract it'll be more interesting than the Moto G to me because the screen size will actually be a little larger than the Moto G because it has physical buttons instead of on screen. Samsungs 5 MP cameras are better than Motorola's, I can say that after owning many Samsung phones over the years and comparing them to my Moto G's camera. Sure the resolution is better on the Moto G but that Samsung is still kinda nice. SO GLAD I switched to T-Mobile. They just get better and better. TMO this is all great but c'mon improve the COVERAGE. Guy's don't start up either, just look at 3rd party coverage maps. If it's not in a urban area, coverage is very spotty. Heck look at their own maps of coverage. When was the last time anyone saw a cell tower going up? Verizon (and sprint) and their subsidiaries use SIMs for LTE, and/or for "global" phones that have both CDMA and GSM/UMTS radios. Research more first. I know Alan isn't a beacon of impartiality or necessarily an expert on much beyond certain specific technological facets, but you should be certain of what you're accusing before making the accusation.. Uh, that's what he said, and that's why it worked. No, GSM and CDMA aren't compatable, but he's not arguing that. Many phones have both CDMA and GMS radios. Take for example, the Nexus 5. It works on band 4 LTE (which Verizon uses) and CDMA 800 and 1900, which Verizon also uses. So theoretically the phone should work on Verizon. But it doesn't because Verizon blocks service to phones with ESNs that they haven't sold themselves. How this Galaxy Avant works on Verizon without being blocked, I don't know. It's possible that Verizon plans on offering this phone as well. Or maybe, since the phone isn't publically available, they haven't blocked it yet. Or maybe the carrier unlocking app did something. Exia, If the device is unlocked and supports the bands then it is true that a Verizon SIM card will work in the T-mobile device. It will not provide voice service as VZW voice service works over the CDMA network. Data services (well, really just internet mostly) will work in VZW LTE areas. This is not well explained in the story above. Actually, it's possible. Some of the newer phones are unlocked able to be used on either network. i.e. Iphone 5s from Verizon is unlocked and while still using "Code Division Multiple Access" technology works just fine on "global system for mobile communications" network that T-Mobile utilizes..
Again as stated above GSM and CDMA are different technology. Verizon uses CDMA for voice calls and text messaging. You could take a Verizon phone and put a T-Mo sim in it and as long as the phone supports the correct frequencies then you would be able to use it because Verizon phones have both GSM and CDMA radios for 4G LTE (because LTE is a next generation GSM network) in them but because T-MO operates on GSM and not CDMA they are not equipped with a CDMA radio which means that a T- Mo phone WILL NOT operate on Verizons network. AT&T have comparable networks that they can work with each other. However, when I switched from AT&T. I was told on three different occasions that my Iphone 4 and 4S would function the same on the T-Mobile side. After unlocking the phone and then joining the network we noticed that our service cut in half almost immediately and continued to go down from there. We would have difficulties in being able to place and receive calls. We would also miss out on some of our text messages. Based on the time we used the phone and the availability of our phone we went from 100% down to about 25% capability of our phone. We would be in what T-Mobile would describe as their 4G areas that have great cell coverage and would have only 2 bars on our phones. We would walk in the mall and our service would drop out and say that’s it’s searching for service. After calling T-Mobile (many times) we were told that it was our phone and because it was an AT&T phone it wasn’t able to match some of their network frequencies. We were told basically too bad if you want it fixed then you need to upgrade to a T-Mobile device. Make sure before you are able to take your device to another carrier then you check with them to see if your device will function with their network. I checked with them and spoke with 5 different people from ranging from Customer Service, Kiosk Personnel, and Tech Support, but got burnt in the end. Unlocking sounds great, you should be able to take your phone with you, but how good is your phone going to be if it only works 25% of the time? It also depends on the phone. I unlocked my Nokia Lumia 900 from AT&T and used it on T-Mobile with few problems, save in some areas where the 3G bands were incompatible I was forced to use 2G, but I did get HSPA+ and LTE access. Pulled 60mbps when it first launched here, too. Yes, the AWS band, which T-Mobile uses for LTE, used to be practically unique to it and few phones supported it. However, I did unlock several AT&T and T-Mobile phones, even low-end ones, and used them abroad on 3G with no problems. This is a fair comment.. The reason is that although the phone is "unlocked" and works to pick up 3G-and even some 4G, it doesn't pick up T-Mobile's "LTE" which is the difference in major metropolitan areas.. Since 4G is rated by speed, you technically could be at "HSPA" speeds, but to truly experience the T-Mobile network you would need to have a "Branded" phone that offers the "LTE". if this was a boat most of you miss it. all that is being said here is that galaxy avant unlike all other cellphones is compatible with all of the networks out no matter who you have. and t-mobile is pushing for all future cellphones to work the same why. that way a customer has more power over the carriers by saying if you don't fix my problem me and my cellphone are going to a different carrier. i like the idea, more power to the customer. but the scare and weak customers just stay with your carrier at all cost.